I could not find canned pineapple in juice, so I bought it in syrup and adapted the filling. I thought the pineapple jam was delicious and the coconut buttercream almost addictive – but wasn’t all that happy about the cake layers. They tasted good, because of the massive amounts of brown sugar, but the texture was a bit heavy in my opinion. If you’re interested in making the piña colada cake, I suggest the cake layers from this recipe. Start by making the cakes: preheat the oven to 180°C/350°F. Butter three 22cm (9in) cake pans, line the base with baking paper and butter the paper as well. Sift together the flour, baking soda, baking powder and salt into the large bowl of a stand mixer. Whisk gently to combine. Add the brown sugar, butter and 1½ cups of the buttermilk to the dry ingredients. With the mixer on low blend to incorporate. Raise the speed to medium and beat until light and fluffy, 2 to 3 minutes. Whisk the eggs with the remaining ¼ cup buttermilk and the vanilla and add to the batter in 3 additions, scraping down the sides of the bowl well and beating only long enough to incorporate between additions. Divide the batter between the 3 pans. Bake for 25-28 minutes or until a cake tester or wooden toothpick inserted in the center comes out clean. Let the layers cool in the pans for 10 minutes, then turn out onto wire racks, carefully peel off the paper and allow to cool completely. Now, the pineapple filling: drain the pineapple and discard the syrup. Set aside 1 slice of pineapple (for decoration) and finely chop the other slices. Place in a medium saucepan with the sugar, lime juice and water. Add the vanilla seeds you scraped from the vanilla bean. Warm over a medium-low heat, stirring to dissolve the sugar, 2 to 3 minutes. Raise the heat to medium and simmer, stirring occasionally, until the juices have almost completely evaporated and turned jam-like in consistency. Let the filling cool completely before using. Can be made a day in advance and refrigerated. Make the buttercream: put the eggs whites and salt in the bowl of an electric mixer fitted with a whip attachment so they are ready to go. Combine the sugar and water in a small saucepan and place over a medium heat, stirring to dissolve the sugar. Bring to the boil and cook without stirring until the syrup reaches the sold boil stage, 114°C/238°F on a candy thermometer. With the mixer on low speed, gradually add the butter, several tablespoons at a time and continue to beat until a smooth fluffy frosting forms. Add the coconut milk in several additions, scraping down the sides of the bowl well after each addition. Measure 1 cup of the buttercream and mix with the pineapple filling. Assembling the cake: place one layer flat side up on a cake stand. Sprinkle a generous 3 tablespoons** rum over the cake. Spread half of the filling over the layer, leaving a small gap around the edge. Add the second layer, sprinkle with more rum and cover with the remaining filling. Top with the third layer and sprinkle with the remaining rum. 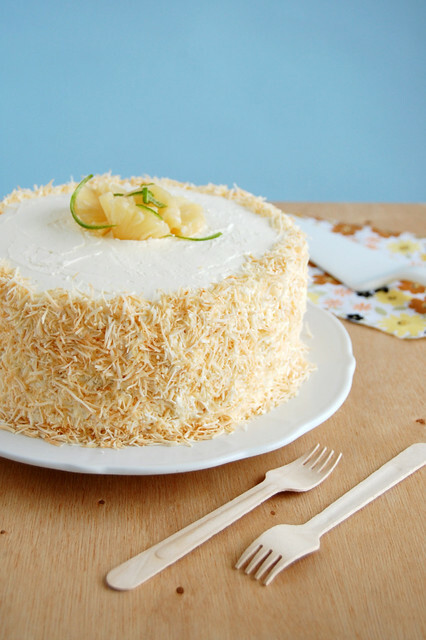 the shredded coconut and top with the reserved pineapple slice. It looks absolutely stunning; it's a shame you felt the cake layers were a bit of a let down. Well, it certainly looks beautiful! Was MIL happy, at least? This is so cute! How fun :). The pineapple and lime juice combi sounds so refreshingly good! Such a beautiful looking cake..looks sooo gorgeous..
All my complementary words are taken above! Stunning, gorgeous, beautiful. I hate that the layers didn't work out as you planned; I've had that happen. Good to know you can switch them out! That cake looks awesome and now I'm craving a pina colada, love that flavour combo! My MIL's birthday is tomorrow and thought of making this for her but she asked for bolo de coco instead. Your cake is so beautiful! That is such an impressive looking cake, Patricia! The flavor combination sounds wonderful too. The picture is making me hungry! I love the combination pineapple and coconut. And the cake looks amazing. Btw, your pictures make everything look great!!!! I'm a big fan of your blog. Congratulations. It looks beautiful! I'm sure your MIL loved it! Fiolunka, thank you for stopping by! Crustabakes, they are wonderful together! Patty, thank you, my dear! I try to be helpful so others can make birthday cakes at home, too! Jen, thank you! That buttercream is delicious! Abby, you are far too kind, darling! Thank you! The layers from the other recipe are really good, I thought you all should know! You are just too sweet. thank you! Lynne, thank you, my dear! Tati, thank you! I'm glad you're enjoying the blog! Katie, she was very pleased - thank you! I'm sure the cake you baked for your dad was amazing. Emily, thank you! I was really happy about choosing something different from the traditional flavors. Hey, there - I'm so glad to hear the recipe was a hit! Thank YOU for letting me know how it turned out!